It took some maneuvering, but a 650b A. Homer Hilsen is back in my stable. I bought a used and repainted frame, and was able to reuse some the parts from my original AHH. It feels very good to have restored this bike, and what it can do for my camping and other geared bike needs (wants), to my rotation. There are two significant changes for the sequel version. I’m experimenting with an non-dynohub lighting system, and bar end shifters. Since I’ve never had bar end shifters before, I decided to route the cables outside the bar tape. If I don’t enjoy them, I can easily go back to downtube shifters (which work fine) without redoing the bar tape. The photo above is from a short test ride Thursday night. On Saturday morning, I’m hoping for a real gravelly, country ride on my country bike. And I’ve already got an idea for a S24O at a new location. Fantabulous! Let the good times roll. 650B? if so are those Hetres in black? Good to see you back with an AHH! I am in the process of trying to decide about painting the Heron and converting it back to 700C. Maybe put some hammered honjos on it. Currently it is bar end shifters, may go back to downtube. Yep, black Hetres. As you know, they work well on gravel. I love the Heron however you configure it. Since you’ve got the 650b gravel bike, maybe the classic Heron is the ticket. The AHH looks pretty close to a fine balance of necessity and room for a few comforts. My LHT was my first experience of bar end shifters and I haven’t had any problems. They’re different, but the same. I look forward to a S240 post! I think you’ll like bar end shifters for their simplicity and because North Texas is flat enough that you are not constantly changing gears anyway. They work well on my road bike. Glad you have a Hilson in the barn again. I like the color, and those wide Compass (?) tires. I can’t wait to see where that bike will take you, and the poetry it will help inspire. I really like the bar end shifters on my oldest Trek. I hope they work well for you. Very nice! I really like the paint. Has an elegant utilitarian appearance; kind of like the gray/maroon Hunqas. 😉 I’ve never tried bar-ends but would like to one day. What brand/model tires are those? Sorry – I already asked that question! Chris! Your bike looks great! I just purchased a Hilsen frame this morning so I was checking out your blog stoking my excitement. 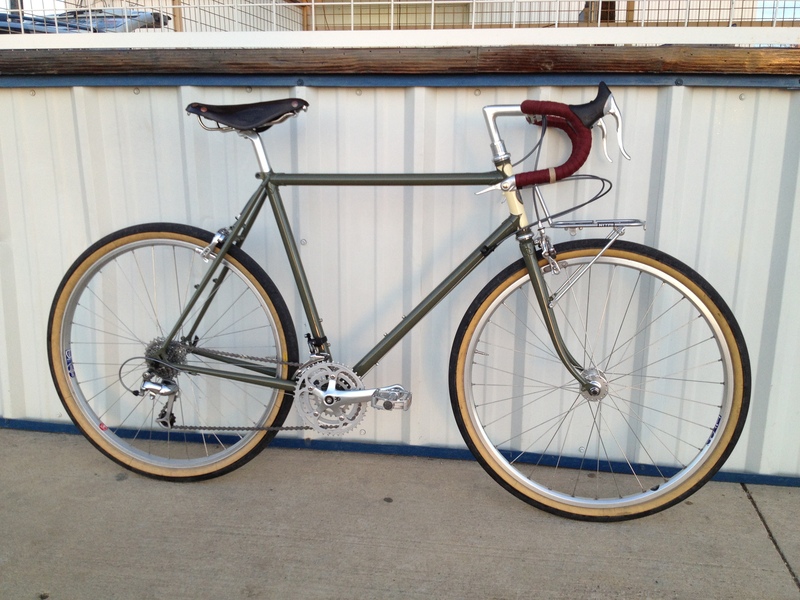 Lost the Rambouillet and Quickbeam in a fire last summer so I’m ready to get back on a Rivendell. Hope to ride with you someday. Thanks, it has been better than expected. I didn’t realize you lost two bikes in a fire! is my reader missing your blog posts? That’s horrible! Happy to here about the new Hilsen, and based on what I remember about your rides, I believe you will love it. Coincidentally, I’ll be making a quick trip down to Austin in mid-March. Not sure I’ll have enough time for a ride, but I’ll be scheming.